Design your landscape using a photo of your property. Design a garden, add a new yard, plant trees and shrubs, and much more with this easy to use software. Photo is currently included with Realtime Landscaping Pro, Plus, and Architect at no extra charge. 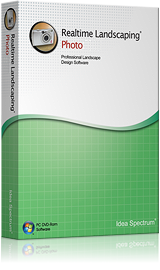 Learn the basics of creating a compelling landscape design in Realtime Landscaping Photo. Learn how to use the Clone tool to remove unwanted objects, fix bare spots in your lawn, and more. Learn how to use the Eraser tool to remove the background of pictures you wish to import into your landscape design, such as plants and accessories. Special Offer - Photo is currently included with Realtime Landscaping Pro, Plus, and Architect at no extra charge. Want Photo, but not sure which product to purchase? Compare our Landscape Software. Download Option: Immediately after making your purchase, you will have the option of downloading the software. Photo will be automatically installed with Realtime Landscaping Pro, Plus, and Architect.